Raise and lower the mask to find the right angle, seal and fit for your patient. The flap increases comfort, improves mask seal and can be removed for easy cleaning. Comfort Gel Blue was designed to take full advantage of the Philips Respironics System One Resistance Control. Working together, the device recognizes when adjustments in therapy are required and carries out these adjustments. 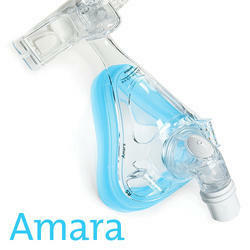 With a silicone cushion, Amara is the smallest, most lightweight traditional full face mask on the market. This option provides great seal performance and is attractive for patients who prefer the look and feel of clear silicone. The Amara with Gel & Silicone Cushions provides two seal options, the traditional style silicone cushion and Philip Respironics'' popular gel cushion. 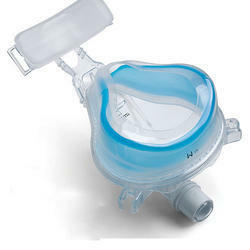 The gel cushion offers the reliable and comfortable feel that Philips Respironics'' gel masks are known for. The thicker inner gel wall contours to the face to try and lock in the best position while the outer gel flap tailors to the face to create a seal. The fine-glide button featured on the Amara''s forehead support allows depth adjustments to be made easily and in small increments. 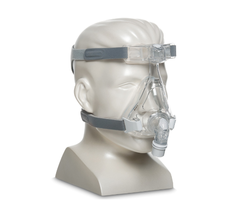 Additional support is found with the proven Premium Forehead Pad for Comfort Series CPAP Masks, which has been carried over from previous masks.